Royal Enfield – Thunderbird ! 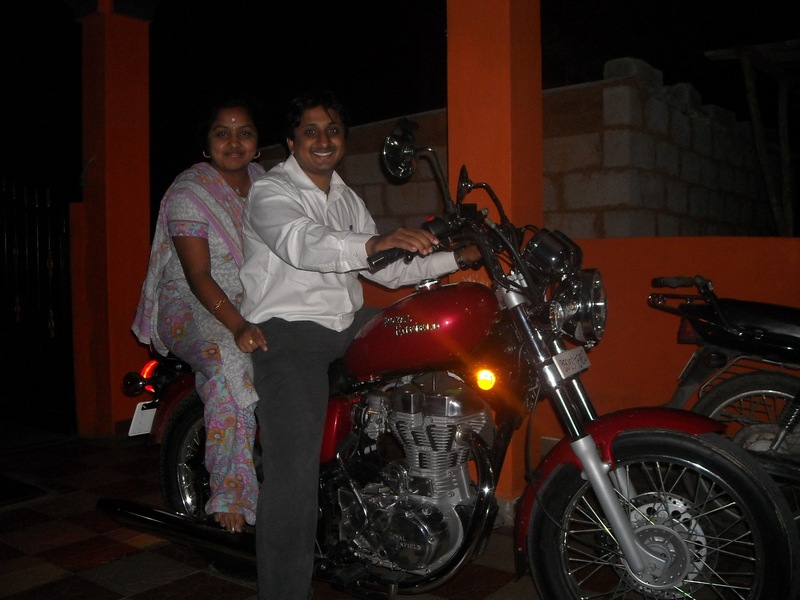 Test riding my brother-in-law’s bike ….. My good old but special splendor (the rear wheel is visible) in the background ! Last weekend had been to Ramalingeshwara temple which is off Bannergatta road. It’s basically a cave temple – Rama’s idols along with Seetha, Lakshmana and Hanuman and another with Shiva linga are present here. There is also a dhyaana mandira. The evenings are extremely quiet here and can spend some peaceful time here. You can also sit atop the small hillock and see around the kind of growth this place has seen. It’s close to the more famous Meenakshi temple – which is thronged by 100s of pilgrims day in and out. To reach, you have to take the road opposite the meenakshi temple (there’s a sign board for Hulimaavu police station) and travel for a little lesser than 1/2 km. Sad that this road is in pitiable condition – maybe that’s the reason for not so many visitors to the temple. Again, since it was a temple visit, didn’t take the camera and hence no pictures to attach, but would definitely recommend everyone to pay a visit to the temple. There is also a “peeta” stated to be 2000 year old where rishis used to come and medidate. From the link: Oldest place in Bangalore, not sure how true it is.